If you followed my journey around the UK National Parks you’ll know there are lots of wonderful walks to do in the UK. From short easy ones to some multi-day hikes! Whether you’re walking a short or long distance what you take for a day hike tends to be the same. Very similar to whether you’re going for a weekend away or a two-week holiday. You pack almost the same amount. The weather in the UK does have a habit of changing often. What to take for your day hike could mean planning for different weather conditions. Even if you’ve checked the weather for the place, if you’re planning on hiking the odd hill, Munro or mountain on your outing then you need to prepare for all conditions. A hot summer’s day the weather can completely change when you’re hiking uphill, clouds can appear from no-where and yes, I’m afraid it can rain! Depending on the walk and place that you choose, there might not be a lot of other people around. Weekends tend to be busier on popular routes but this doesn’t mean that you will see lots of people. During my time hiking around the UK National Parks, I walked during the week and weekends. Sometimes I wouldn’t see anyone else all day. And would have to make do with chatting to the sheep and cows haha! On my trips alone, I’m solely reliant on taking everything I need. But just because you’re going with someone else or a big group doesn’t mean that you shouldn’t bother packing everything as if you were going solo. Take responsibility for enjoying your day trip, without relying on others. Although, I’m not saying don’t share your sweets! My list below includes everything plus a few optional extras that I take on my day hikes in the UK. You might think not these are necessary. But imagine either you or a member of your party has an accident. Some of these items are essential for keeping you safe and warm. It might be extra weight to carry but it’s worth it. Plus think of those extra muscles you’ll build! 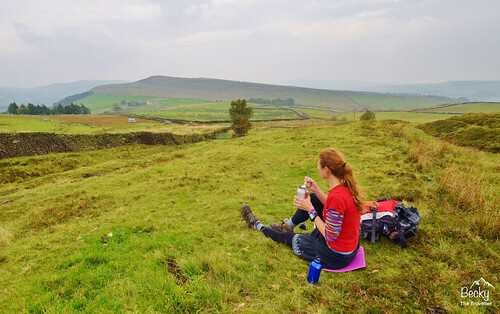 what to pack if you’re going on a day hike in the UK? For starters, you’re going to need something to put everything for your day hike in. I’m a rucksack addict (haha) and I have a variety of sizes. My preference is to take a slightly bigger bag. So I have the option to fit my extra layers or jacket if I get too hot! It’s worth investing in a good rucksack and finding one that suits you. I like to fit my water bottles in the side pockets so I can keep hydrated. Also, I find a chest strap handy as it keeps the rucksack close-fitting and feels more comfortable when I’m hiking. Check out more options here for the best hiking backpacks for your walk. Even on hot sunny days, I will always pack my waterproof jacket. Why might you ask? Well the weather in the UK can be unpredictable. Plus the temperature can drop considerably depending on the height you are climbing up to. So you can always use as an extra layer to keep you warm. 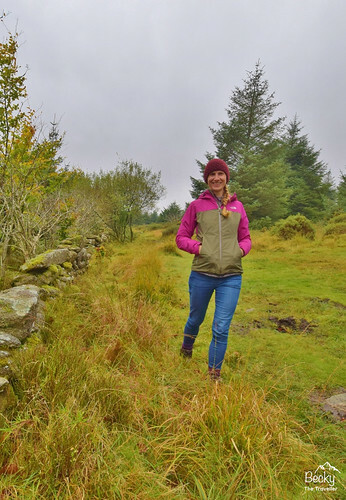 Read my Berghaus Paclite jacket review here. Now as stylish as these are they do have their benefits. Firstly, they make a lovely swishing sound as you walk! But secondly, if it does rain it’s great to be ready. The good thing about waterproof trousers is that they are generally lightweight so not too much extra for you to carry. And even if it doesn’t rain, if the weather turns cold then they are an extra layer to keep you warm. You’ll notice that I don’t like the cold brrr! You next hiking challenge? Ben Nevis Walk in Scotland – Hiking solo up UK’s highest mountain! It sounds obvious but don’t forget your water bottle. And filling it up helps too! The amount of water you take should reflect the weather and distance you will be hiking. On a hot sunny day in the UK (yes we do have those sometimes!) I would carry up to 2 litres of water. My motto, it’s best to carry extra than run out and have a headache because you’re dehydrated. Depending on where you are walking there might be streams you can fill up your water bottles. Take some water purification tablets with you. In 30 minutes (depending on instructions) you can have water to drink. I love to take a hot drink on my day hikes. It’s great when you reach that summit and need a something to warm you up. I use the Sigg Hot & Cold which means I can have a sip of something hot without needing a mug. You’ll always find peppermint tea in my flask if you ask. And I’m happy to share too. Just in case you meet me on one of my walks! 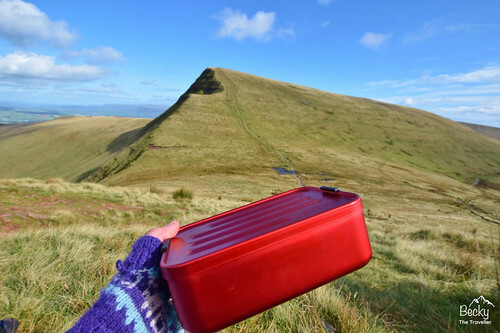 6. what food to pack for your UK day hike? Depending on the length of your day hike, you might need a lunch as well as snacks for your trip. I normally pack sandwiches, crisps, some fruit and chocolate (I love chocolate). Even if you aren’t planning a really long hike, it’s always good to have a selection of snacks in your bag. I would suggest fruit, nuts, breakfast bars and maybe some cake. After all, you are out hiking so you’re allowed to treat yourself! This is an obvious one in the middle of summer, when we have tropical (well mini heat waves). But even in Spring and Autumn, the sun can burn so it’s best to keep covered or put the sun cream on. Sunglasses are handy on bright sunny days, depending on which direction you are walking in they stop the glare! I am a fan of the traditional map and compass. Why? Because I like visual aids and for me, a map does the trick. That’s not to say I don’t agree with modern GPS watches and gadgets. But I know that a map won’t run out of battery. a) It’s great to know where you are on your walk. Planning when to stop for a break. 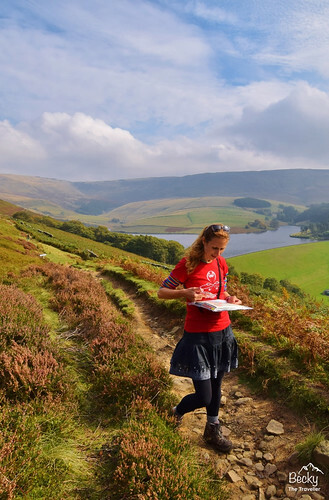 And it means you can find scenery and spot landmarks which make the walk more interesting. b) In an emergency, you will need to be able to tell your rescues exactly where you are. c) You never know when you might need to take a detour e.g. a flooded field or a herd of cows (Yes this happened to me, so thank goodness I had my map and could find an alternative route). My first aid kit seems to grow and grow. I think I have everything I need but then find something else is missing. On my hike down from Scafell Pike in the Lake District my ankle was hurting. I had painkillers, plasters, bandages but nothing that would help. It wasn’t until I chatted with a lovely guy who gave me his strapping tape (in fact he took my sock off and taped it up too). Now another item in the kit! What do I keep in my first aid kit? – Paracetamol, painkillers, plasters (including blister ones), antiseptic wipes, bandages, throat lozenges and a foil blanket. It’s lovely to be able to get away from technology whilst you’re out on a hike. But in case of an emergency, a phone is always a handy item to have too. Please note some parts of the National Parks/remote UK countryside will not have a phone signal. Imagine getting lost in the fog or injuring yourself and not being able to walk. Yes, I know a little dramatic but it can happen. I always carry a whistle attached to the front of my bag. Think would you rather yell for help for an hour or blow a whistle to attract attention. Remember in ‘Titanic’ – what did Rose do!!! Pack extra clothes (hat, gloves and fleece) according to the weather. The British weather can change quickly so you need to be prepared. Above is me at the top of Ben Nevis in the clouds and it was freezing! The is great for day hikes with plenty of hours of daylight. But as winter starts to close in a head torch is useful to have. You never know if a walk might end up taking longer so make sure you can see where you are walking! These are bags to keep your belongings dry inside your main rucksack. I have many in all different sizes and they not only keep my clothes dry but are great for protecting my camera and phone. Perfect on my Welsh 3000s Challenge when it rained for 11 hours straight!!! I love my penknife and it comes on all my hiking trips. My is a Swiss Army Knife and has lots of gadgets so I am ready for any occasion!! What optional items to pack for your day Hike? Here are a couple of other things I take with me on my hikes. A sense of adventure – sorry cheesy but true!! Can you name all 15 National Parks in the UK? Click here to see how many you know! 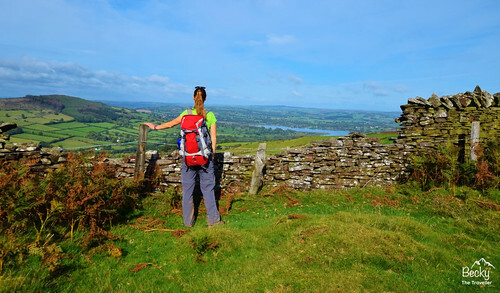 Do you go hiking regularly in the UK? What else do you take with you? Tell me in the comments below, I’d love to know if I’m missing anything! *Becky the Traveller contains affiliate links. If you make a purchase through these links, I earn a small commission at no extra cost to you. These help to me continue running this site, sharing free advice and tips from my adventures. Thanks for reading! Ah, now that reminds me. Ah, really good question. I’ve tried walking sticks and they definitely help, especially going up and down hills! I have a couple of reasons for not using them, firstly I love taking photos so having walking sticks and a camera isn’t practical for me. That’s not to say you can’t take photos but I found every time having to stop, take my wrist out of the loop was too much of a pain. The second reason I don’t use is that I have terrible circulation in my hands, I find that I need to keep my fingers moving, so having them in a rigid position on the sticks means they get cold quickly. I think they help provide stability if that’s what you are after but they genuinely make walking easier too. I have a pair if you ever want to try some out, I don’t use them but have them in my outdoor gear cupboard!! I always carry peppermint tea, too! Warm clothes are always a good idea and things for staying dry (yourself and gear) are essential. It’s good to know when I make it over to the UK to hike I will be prepared!